Welcome to my Events Informational page! I am a transformational coach – and I assist people to change their unwanted behaviours or emotional responses. This skill set can empower anybody who wants to up their game in a business, sport or personal arena, using cutting edge performance coaching skills. The skills we can assist people in developing can take them from Performance Coaching, right through to therapeutic use. Training in these innovative techniques is now in our region – both Spectrum Performance Coaching, the precursor to, and its follow on, Spectrum Emotional Coaching. You may be an existing coach, who wants to go further with your clients and improve your client’s outcomes to an even deeper, lasting level. You may be a therapist, and want something extra in your toolkit to help people collapse out unhelpful states in a quick and elegant way conversationally. You may be a manager, or a leader, or business person, working with individuals or teams of people and you want additional tools to assist with adding that extra bit of rocket fuel, completely and congruently and in an acceptable way for the individuals you work with. Or you could be a family member, and you want to help your kith and kin become the best that they can be, helping to remove whatever is holding them back, empowering them into a brighter future now. Whatever your situation, you can imagine now the changes that you can make, can’t you? What we will show you and help you practice are extremely innovative, and research-based ways of working, where you will be able to take these and use them in your life as you go forwards. Maybe you haven’t thought about just how far your own impact could be yet, and maybe you have. How would it feel if you were able to assist someone in releasing their own blocks to moving forward after having removed your own? This programme is designed to lead the delegate through the steps of learning all the principles associated with performance coaching and applying them practically in many situations. It is an interactive programme that involves a level of theory underpinned with lots of practice that has been tried and tested in different arenas of performance where results are key to success. The content of this programme is very innovative as it also has some change elements that are completely unique and very effective for creating change and getting rid of performance blocks. General refreshments provided. Lunches and overnight accommodation not provided. Contact tanya@creatingcorechange.co.uk directly to enquire or to book a place now. (In order to attend this course you will have been required to complete Spectrum Performance Coaching, trained by a qualified trainer from Spectrum Affiliates Ltd. This course builds on the prior content of Performance Coaching). Delegates who attend this programme are normally interested in becoming a Coach or Mentor and want to use Coaching concepts to develop their clients, staff or colleagues. This is a natural extension of what has been previously learnt from the Performance Coaching programme and is appealing to those who want to be able to initiate change and support their clients through emotional transition in any area of life. Spectrum Emotional Coaching TM is the latest approach in working with problems associated with negative emotions. It is ground-breaking and innovative in its design and is remarkably easy to use. Spectrum Emotional CoachingTM can be used in any area of performance, creating remedial and generative change as desired by the client. Spectrum Emotional Coaching TM leads people into change gently and is easy to embrace and use with even the most nervous clients. It creates lasting change very quickly and progressively helps the client to regain self-reliance at a pace that is dictated by the client and supported by the coach. Spectrum Emotional Coaching TM involves talking in a one-to-one situation to establish trust and safety. The Coach will develop skills to find the area of the problem and will work with the emotions connected to the root cause as opposed to the symptoms. 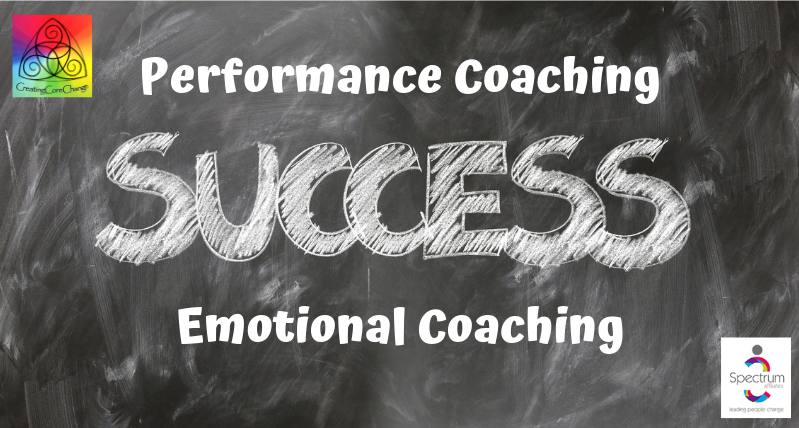 If both Spectrum Performance Coaching and Spectrum Emotional Coaching are booked and paid for together before the dates when announced, a 10% Early Bird discount will apply.